Extraneural metastasis (ENM) from central nervous system (CNS) tumors are rare, though it has been described in relation with a variety of intracranial tumors, such as malignant gliomas, medulloblastomas and meningiomas. First well documented case of metastasis outside CNS was described by Nelson in 1936. According to Liwnicz and Rubinstein,  medulloblastomas are one of the most common intracranial tumors to have ENM. Despite best available treatment, ENM has a poor prognosis; though survival depends upon the site of metastasis, time interval to develop ENM and age at the time of ENM among other factors. Mazloom et al. in a recent review, described 119 cases of ENM published up to 2007, with bony and bone marrow metastasis being the most common. However, subcutaneous metastasis involving the muscle is exceedingly rare. 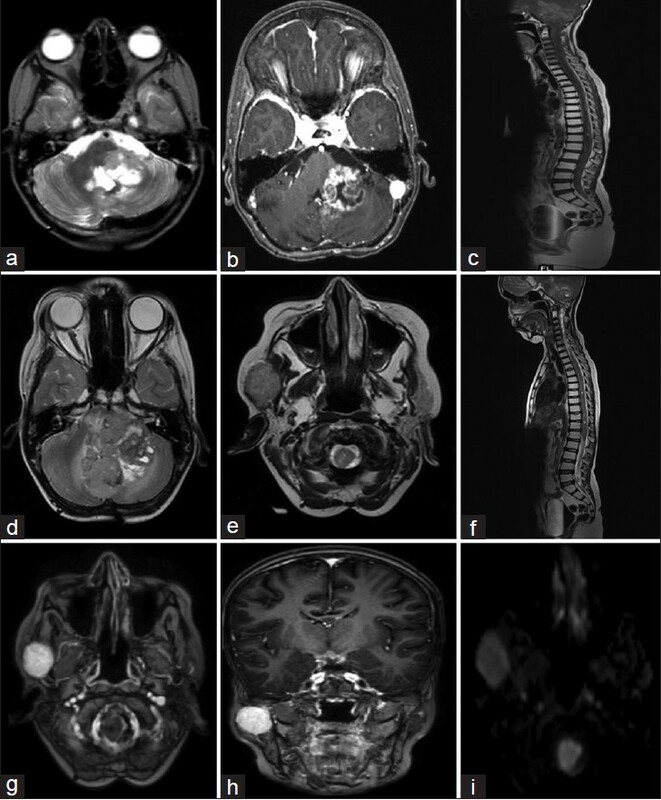 We described a case of histopathologically proven subcutaneous ENM at right masseter region in a 13-year-old boy with medulloblastoma, diagnosed 4 years after the primary surgery. This 9-year-old boy presented with a history of gait ataxia for 1 month, and headache, vomiting and progressive drowsiness for 20 days. Computed tomography (CT) scan and magnetic resonance imaging (MRI) brain showed the presence of a midline posterior fossa mass with small punctate calcification and heterogeneous enhancement, causing obstructive hydrocephalus. Due to his poor sensorium, the child underwent an urgent right ventriculo-peritoneal shunt. Following this, he underwent midline suboccipital craniectomy, C1 posterior arch excision and gross total decompression of tumor. Post-operative imaging showed complete excision of the tumor. He was referred to an Oncology Center, where he was treated with cranio-spinal irradiation, along with chemotherapy. At 1 year follow-up, patient was doing well apart from mild gait ataxia, and a cranio-spinal MRI did not show any evidence of residual disease. However, CT scan done 27 months after surgery, showed a 5 mm × 15 mm enhancing lesion on left cerebellar hemisphere extending through left foramen of Luschka. Patient was advised excision of the tumor, followed by further adjuvant therapy, however he was lost to follow-up after that. After 4 years of primary surgery, patient presented with a swelling in right masseter region. He also had occasional vomiting and gait ataxia. MRI brain and spine showed a 3.6 cm × 2.7 cm irregular lobulated heterogeneous lesion involving left middle cerebellar peduncle and inferior vermis with diffuse pachymeningeal thickening and enhancement and diffuse spinal metastasis. In addition, there was a well-defined solid cystic lesion, heterointense, with areas of T2 shortening, enhancing brilliantly on contrast, in right masseter region. The lesion was located superficial to the mandible and was infiltrating the muscle and coming to the subcutaneous plane [Figure 1]. Imaging character of the lesion was same as that of cerebellar lesion. Chest X-ray, Ultrasound of the abdomen and bone scan was performed to rule out any other ENM, and were all negative. There were no other ENM. 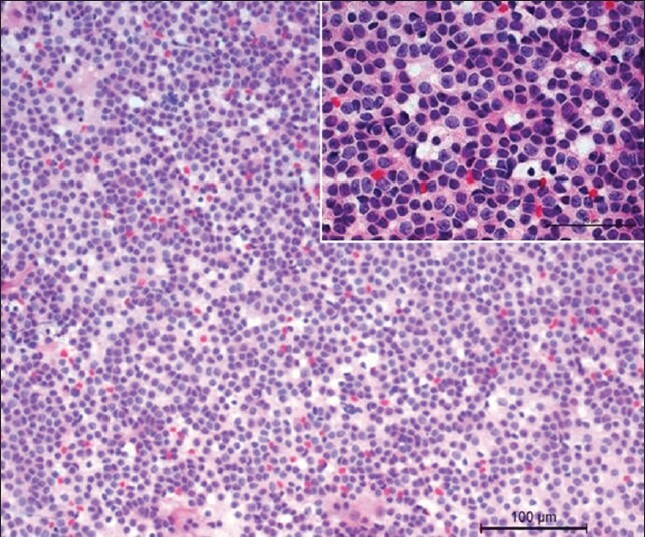 Fine needle aspiration cytology from the subcutaneous swelling showed numerous large basophilic cells with high nuclear cytoplasmic ratio, suggestive of medulloblastoma [Figure 2]. In view of disseminated metastasis, the child was given palliative and supportive care. He died 11 month after the diagnosis of ENM because of disseminated disease. Dissemination of medulloblastoma via the cerebrospinal fluid, with resultant leptomeningeal spread, both in the cranial and spinal subarachnoid space, is well documented in the literature. In contrast, ENM is rare, with incidence being 7-10%. , The commonest site of ENM from medulloblastomas is bone and bone marrow, followed by lymph nodes, lung and liver. ENM can occur in conjunction with local recurrence in the posterior fossa, or without local recurrence. Other sites of ENM such as muscle and subcutaneous tissue are very rarely reported. In their excellent review of literature, Mazloom et al. reported 119 patients with medulloblastoma having ENM reported in literature from 1961 to 2007. Bone was the commonest site of metastasis (84.4%). Other sites of ENM were bone marrow (26.9%), lymph node (14.7%), lung (6.4%) and liver (6.4%). There were 14 cases reported as "other sites" which comprised pancreas, retroperitoneum, pleura, paranasal sinuses, skin, oral cavity, and connective tissue. In another review, Rochkind et al. found only six patients with muscle and subcutaneous metastasis (two in children and four in adults). Galarza et al. reported a patient with pure subcutaneous seeding from medulloblastoma, but these seedlings were in the neck incision adjacent to the surgical incision of the medulloblastoma surgery, and in the abdomen close to the shunt surgery incision. This spread was possibly implanted during the previous surgical procedures. The present report is the 7 th report of subcutaneous and muscular metastasis in literature, and the third case in the pediatric population. The prognosis of patients with ENM is dismal, however, it depends on the status of primary disease as well. In their review, Mazloom et al. reported that median survival of patients with ENM with or without CNS involvement is 5 months and 24 months respectively. Two-thirds of patients with ENM who did not have CNS involvement were alive at 2 years. Radiotherapy (RT) was shown to be beneficial in patients with ENM without CNS involvement. However, the prognosis of patients with ENM with CNS involvement is dismal, and addition of further adjuvant treatment has not shown to give any survival benefit. Patients with concomitant CNS involvement, prior shunt surgery, lung and liver metastasis, age <16 years at the time of ENM, time interval from initial development to ENM development <18 months were found to be poor prognostic factors. , The present patient had large posterior fossa recurrence, diffuse leptomeningeal involvement and multiple cranial and spinal subarachnoid seedlings, along with the ENM. All these poor prognostic factors precluded any consideration for further adjuvant therapy, and he died 11 months after the development of ENM. 1. Nelson A. Metastases of intracranial tumor. Am J Cancer 1936;(28):1-12. 2. Liwnicz BH, Rubinstein LJ. The pathways of extraneural spread in metastasizing gliomas: A report of three cases and critical review of the literature. Hum Pathol 1979;10:453-67. 3. Mazloom A, Zangeneh AH, Paulino AC. Prognostic factors after extraneural metastasis of medulloblastoma. Int J Radiat Oncol Biol Phys 2010;78:72-8. 4. Rochkind S, Blatt I, Sadeh M, Goldhammer Y. Extracranial metastases of medulloblastoma in adults: Literature review. J Neurol Neurosurg Psychiatry 1991;54:80-6. 5. Oberman HA, Hewitt WC Jr, Kalivoda J. Medulloblastomas with distant metastases. Am J Clin Pathol 1963;39:148-60. 6. McComb JG, Davis RL, Isaacs H Jr, Landing BH. Medulloblastoma presenting as neck tumors in 2 infants. Ann Neurol 1980;7:113-7. 7. Lewis MB, Nunes LB, Powell DE, Shnider BI. Extra-axial spread of medulloblastoma. Cancer 1973;31:1287-97.